Here is an iFolloSports.com original photo of Hollywood icon Denzel Washington interacting with Dallas Cowboys rookie RB Ezekiel Elliott, during Cowboys camp, Saturday in Oxnard, California. 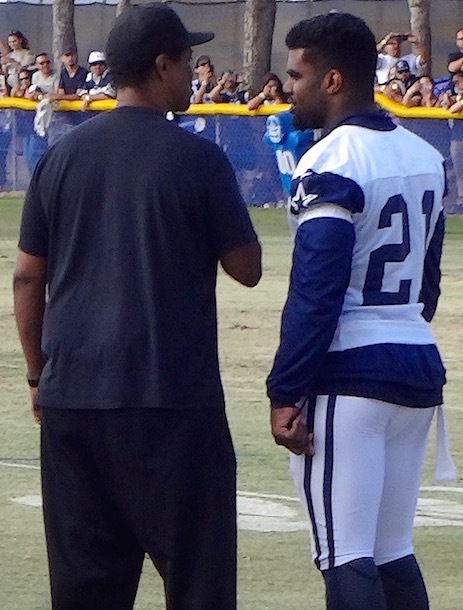 The Denzel Washington Ezekiel Elliott interaction was a big highlight for fans in attendance. iFolloSports.com original video of the scene is available via this link. This article provides more information on Washington’s visit to Cowboys camp, including video of his extended interaction with fans.